Example 1 :The neutral point of a 11 kV alternator is earthed through a resistance of 12Ω, the relay is set top operate when there is out of balance current of 0.8 A. The C.T.s have a ratio of 200/5. What percentage of the winding is protected against earth faults. What must be the minimum value of earthing resistance required to give 90% of protection to each phase ? It is necessary to give 90% protection. This is the minimum value of resistance to give 90% protection to the largest machine. Example 2 : A 50 MVA, 3 phase, 33 kV synchronous generator is protected by the Merz-Price protection using 1000/5 ratio C.T.s. It is provided with restricted earth fault protection with the earthing resistance of 7.5 Ω . Calculate the percentage of winding unprotected in each phase against earth faults if the minimum operating current of the relay is 0.5 A. Example 3 : A 13.2 kV, 3 phase, 100 MW at 0.8 p.f. 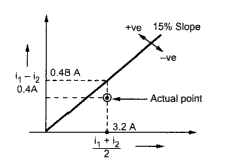 lag, alternator has reactance of 0.2 p.u. If it is equipped with a circulating current differential protection set to operate at least at 500 A fault current, determine the magnitude of the neutral grounding resistance that leaves the 10% of the winding unprotected. VL = 13.2 kV = 0.8 P = 100 MW X = 0.2 p.u. This is the required resistance in neutral earthing. Example 4: An alternator stator winding protected by a percentage differential relay is shown in the Fig. 1. The relay has 15% slope of characteristics (I1 - I2 ) against (I1 + I2 /2). The high resistance ground fault has occurred near the grounded neutral end of the generator winding while the generator is carrying load. Thwe currents flowing at each end of the generator winding are also shown. Assuming C.T. ratio to be 500/5 A, will the the relay operate to trip the circuit breaker ? The direction of currents are shown in the Fig. 2. The current flowing through the relay coil is i1 - i2. This is shown in the Fig.3. Thus - must be more than 0.48 A i.e. above the line to operate the relay but actual point is located below the line in negative torque region. Hence the relay will not operate. Thank you so much for sharing such an awesome blog...Nice tips! Very well written information. Many thanks!